I am not sure if this is the case in Indonesia, but i think Indonesian are immune to Ciguatera or the Indonesian marine department are telling the truth that only .01% of Indonesia water is affected. Most of the fish are sold in the local market and consume by Indonesian daily. Is also sold in all the seafood restaurant. I guess we are bless in Bali free from dinoflagellate (a type of algae). All the different cod species that we eat have never given us any trouble, but instead we all have satisfied stomach. We also export the majority of the 400 different species around the world. i have never heard any complain or problem from the exporter customer. We hope this can continue to the next generation. It will be hard to explain to grandchildren that we used to enjoy eating this fish and sorry you guys cant eat. 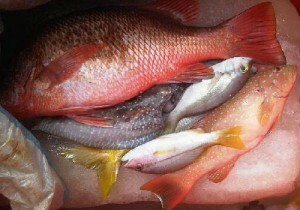 Avoid the roe, liver, skin guts, and head of the reef fish.I disagree with the head, is the best part of the fish. This is crazy! We need to avoid nuts, alcohol beverages and seed products. I guess everyone who eats at kedongan and jimbaran are in trouble. and no Bintang beer for us after spearfishing! Seek help if you feel the symptom. Ciguatera is a kind of food poisoning contracted from eating certain species of fish in tropical and sub-tropical waters. Cases of ciguatera have been reported between 35° north and 35° south. It is more usually concentrated around coral reef areas and one theory is that the toxic algae grow on damaged coral. The toxin begins as clinging to seaweed, coral and algae, which is then eaten by herbivorous fish who are in turn eaten by larger carnivorous fish. 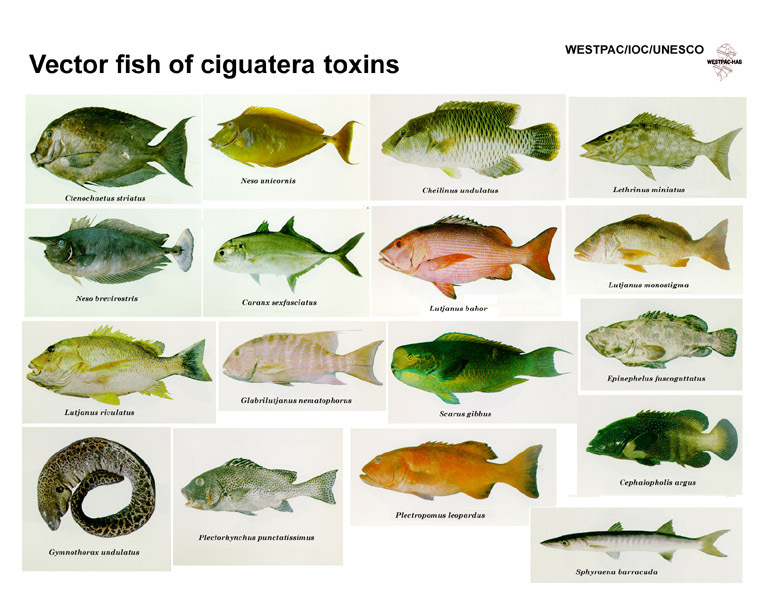 In this way, the toxins move up the food chain, all the while accumulating in the larger fishes system.When we eat lots of these larger fish, which are effected by ciguatera, we then contract the poisoning. Which Fish to avoid according to scientist? Basically all the grouper you can find in the island of the god is dangerous, Mangrove jack, scribbled snapper, coral trout, Spanish mackerel. The list is depressing, i hope this is not a scam. – Cold alloynia, which is a burning sensation on contact with cold. Many of us probably already have a small amount of ciguatoxin built up in our system from eating spanish mackerel and coral trout. Once you have had ciguatera once, subsequent break outs are likely to occur. If you continue to eat contaminated fish damage could be permanent, so be careful. Treatment of ciguatera poisoning is largely supportive and symptom driven. GI decontamination with activated charcoal may be of value if performed within 3-4 hours of ingestion. Avoid syrup of ipecac because of its potential to worsen fluid losses. Orogastric lavage is not recommended; it is not of proven benefit for ciguatera poisoning, and risks of this procedure are likely to outweigh benefits. Antiemetics may control nausea and vomiting. Cool showers and antihistamines have been recommended to relieve pruritus. Manage hypotension with volume replacement. Pressor agents rarely are needed. Medications used to treat ciguatera poisoning include (1) neurologic agents, (2) serotonin-norepinephrine reuptake inhibitors, (3) antihistamines, (4) analgesics, (5) antipyretics, and (6) anti-inflammatories. One group in Japan has reported developing a strategy to use monoclonal antibodies to treat ciguatera toxicity. Possibly an effective treatment will be available in the near future. Opiates and barbiturates also may exacerbate symptoms and are not recommended. I live in Bali now and have for 13 years I love to spear and eat fish. I got a very serious dose of Cigutera back in 1981 in the Soloman Islands. It took a month to get back on feet again and I was young and in great shape. Cases in the area were common back then but at that time we never even thought about Cig. Now there are testing strips and more knowledge. But I will never forget that month that me and 2 other people ate and enjoyed a Epinephilus Fuscogutatus and got our asses kicked HARD for a month. One was a girl was previously a ski racer and had blown both knees out previously and had major operations on her knees. This created massive scare tissue and the Cig attacked this area and cause wracking, screaming pain for her for 3 straight days. The symptoms of Cig are very wide ranging. It is a very challenging and interesting infliction for sure! I have lots more to tell……..